Can you spot the difference in this picture? If you’re guessing that it’s the white townhouse in the middle — then you’re right! Well it is quite obvious! 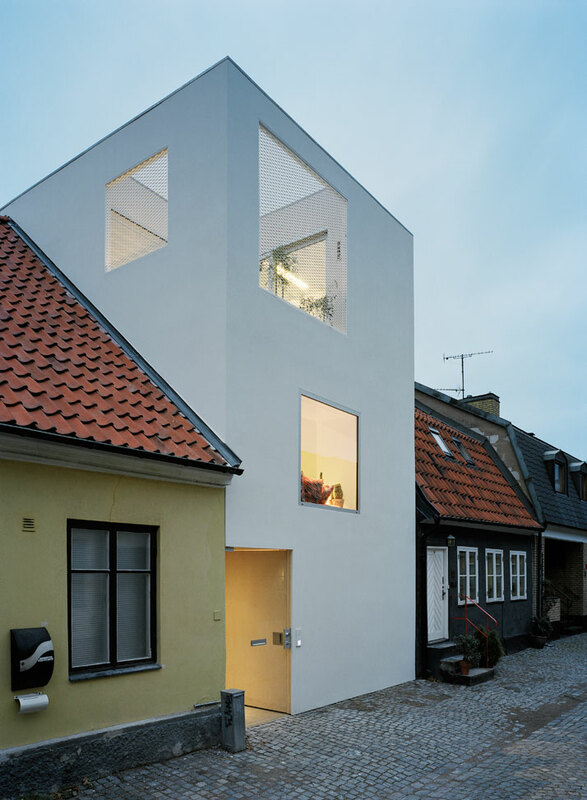 This townhouse in Landskrona, Sweden by Elding Oscarson Architecture is rather different from its neighbors; Elding Oscarson’s architectural offices designed this unique townhouse in 2009, on a small traditional street in the southern Swedish town of Landskrona. 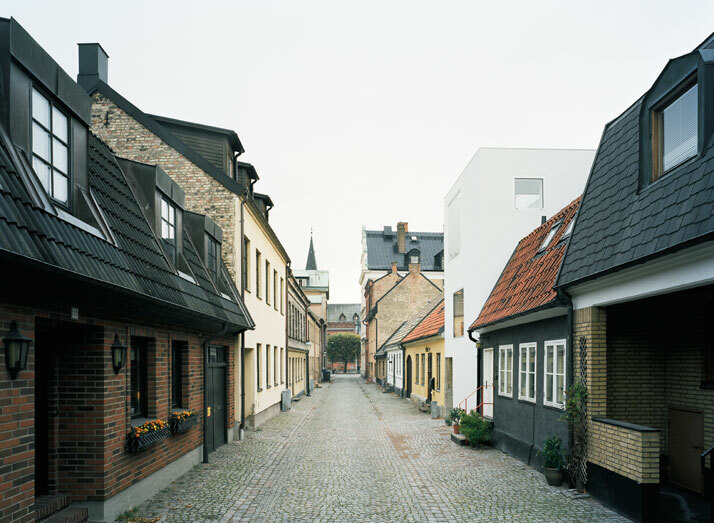 Elding Oscarson Architects have exploited the small plot of land, to utilize it to its maximum as they have filled the empty plot with a conformist slab, sandwiched deliberately at odds with the old-fashioned but unassumingly beautiful surrounding architecture. The all-white 125 square meter townhouse has been built on a petite plot measuring a mere 75 square meters (807 square feet), facing a street with a colorful hidden world inside the city block, which is conveniently located by the beach in this growing region. Elding Oscarson Architects sought to create an intense presence in this small-scale, contrasting, naturally worn place in the completed project – a feeling of almost being outdoors. The result of this intense presence was the creation of an entirely white townhouse with elegantly audacious geometrical proportions and lucidity with its unique architectural design; juxtaposing the traditional surrounding environment with a distinctively different, yet equally gorgeous, architectural style. This sharp contrast expresses inherent clarity, but more importantly highlights the beauty of the surroundings. The stark-white townhouse is the home to a couple involved in the art business who also operate a café; the specifications for this residence were that the townhouse would also be used as a private gallery. This created the need for walls; not walls for privacy but walls for art! 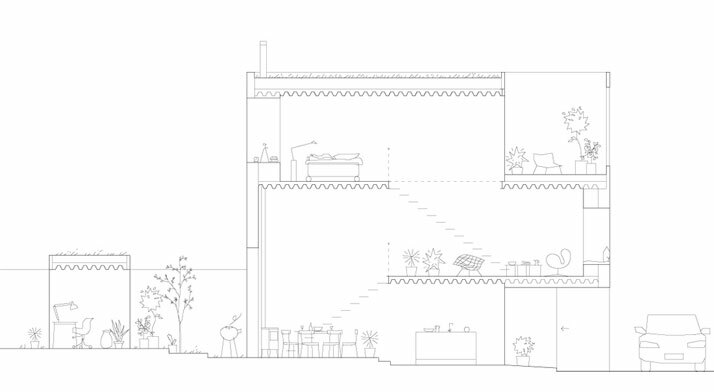 The architects created a single space, softly partitioned by thin exposed steel slabs that span the entire width of the house and divide it into the kitchen, the dining room, the living room, the library, the bedroom, the bathroom and a roof terrace. A home office was also incorporated but in a detached building across a small garden; mechanical and service spaces fit next to the entrance. 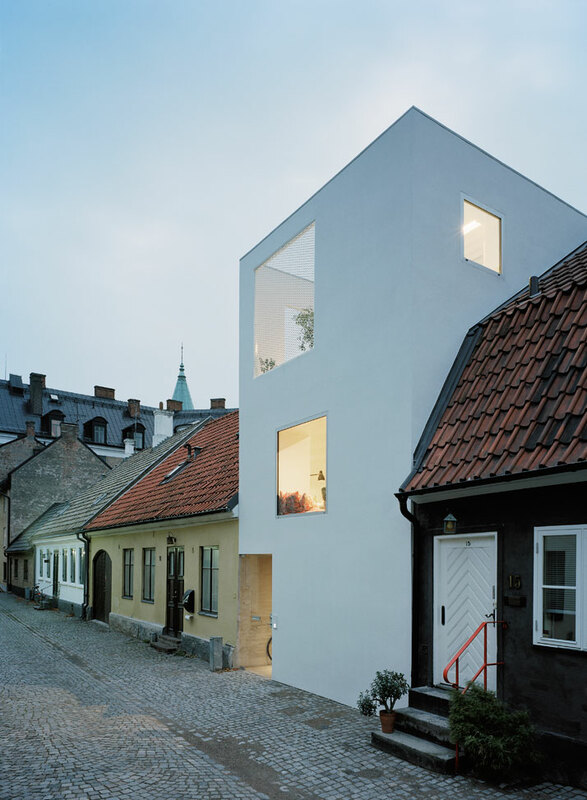 The extreme presence of the stark-white townhouse with the elegantly audacious geometrical composition makes references to the other traditional buildings; the height of the new townhouse respects the roof height of the surrounding gabled roofs, while the windows and the front door ‘impersonate’ the linear geometry of the surrounding environment. The minimum space with its many limitations was the canvas for the architects to overcome (in an ingenious manner), the various challenges that they faced; creating a space which flows smoothly as it provides ample space for the requirements which were set forth by the clients, yet making the spaces appear more expansive than they actually are. The compressed slab construction, unconventional ceiling heights, and the ground floor flush to the street level permitted fitting three floors into this volume. 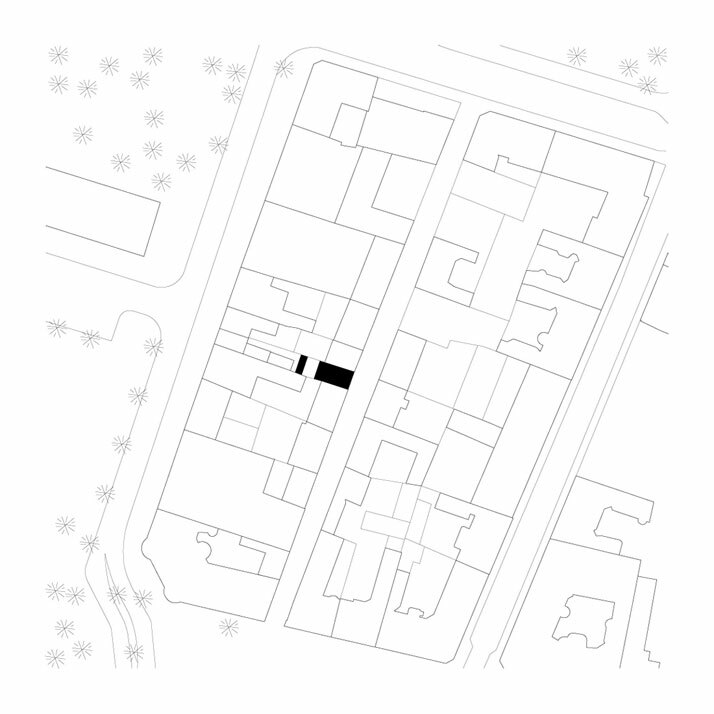 The distribution of the single space aims at a non-minimalistic and lively sequence of restricted and airy spaces, niches, interiors and exteriors, horizontal and vertical views as well as carefully framed views of the site. 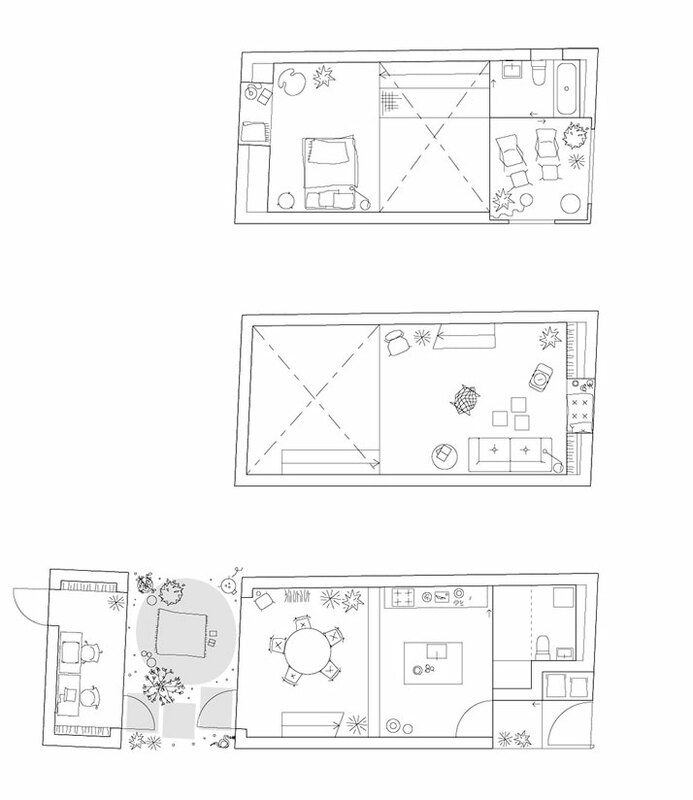 The continuous interior space opens up to the street, to the middle of the block, and to the sky above. 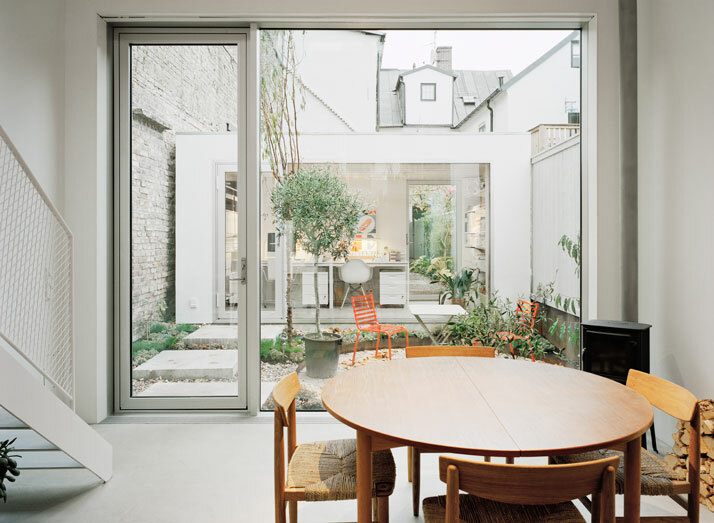 From the rooftop courtyard to the large expanses of insulated glass windows, natural light infuses into the structure. Not even the bridge on the third floor nor the stair treads encumber the light that flows from top to bottom. 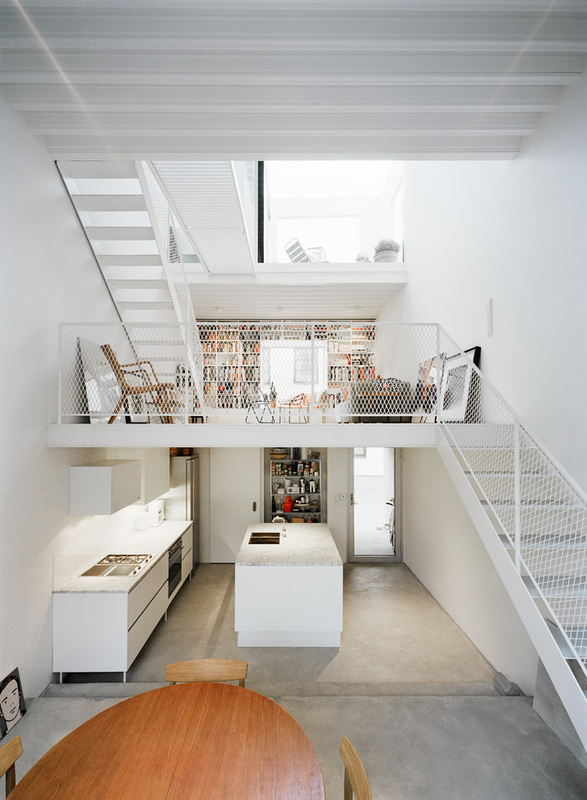 The openness and airy spaces generate a structure which is bold yet transparent. All facades offer uninterrupted views. 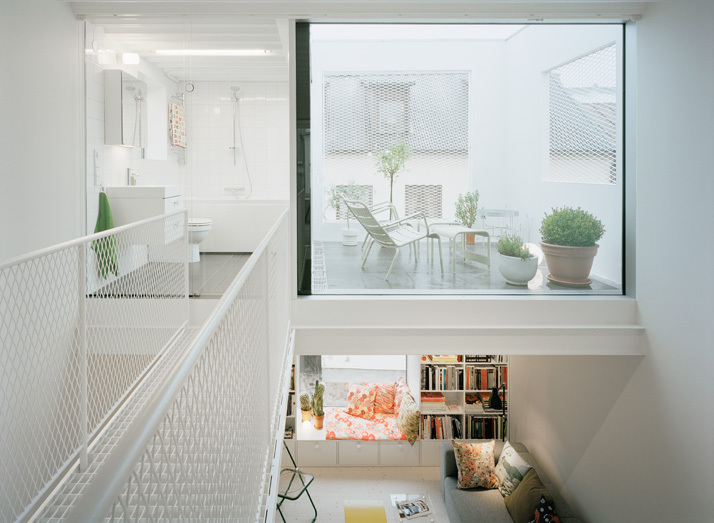 All in all, the stark-white townhouse is designed in such a way that it allows for the occupants to enjoy the uninterrupted views of the urban streetscape through the transparency provided in the architectural design. The architects have exploited the petite plot of land, to utilize it to its maximum as they have filled the empty plot with a conformist slab, sandwiched deliberately at odds with the old-fashioned but unassumingly beautiful surrounding architecture.